Last night Stuart and I went to see new stage musical Bend It Like Beckham at the Phoenix Theatre in London's glitzy West End. Based upon the 2002 British comedy-drama film starring Parminder Nagra, Keira Knightley and Jonathan Rhys Meyers its title refers to the football player David Beckham and his skill at scoring from free kicks by "bending" the ball past a wall of defenders. The show follows the same plot as the film and is about Jess, the 18-year-old daughter of Punjabi Sikhs in London. She is infatuated with football but her parents have forbidden her to play because she is a girl. She joins a local women's team, which makes its way to the top of the league. And you know what? It's really rather good. 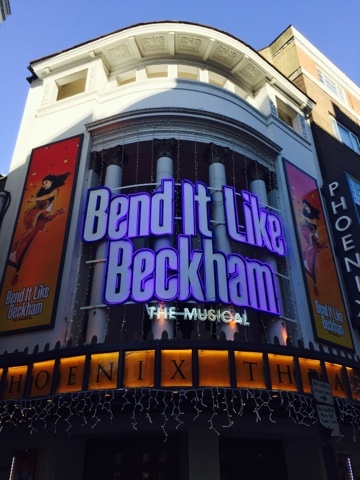 We went in with low expectations (new musicals are having a fairly short half-life in the West End at the moment) and were more than pleasantly surprised. There are wayward daughters aplenty, Bollywood dancing by the bucket-load and tap-dancing footballers. What's not to like? It was funny, the songs were good and it did exactly what it said on the tin in that it perfectly recreated the feel-good factor of the film. It was full of easy humour, an impeccable sense of milieu that was the result of knowing the culture intimately enough to poke fun at it while understanding its underlying integrity. The film's director Gurinder Chadha was sitting behind us and she seemed to be enjoying herself.